NOTE: We are an alliance guild, but each guild grows independently, we don't move people around or treat any of our guilds as feeders. 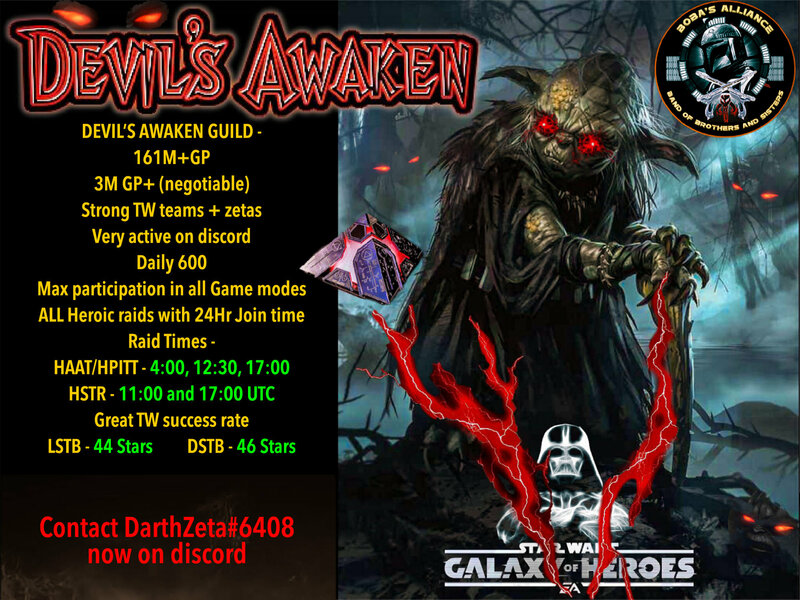 We are still looking for active players who want to be part of a guild with alot of great people. We are extremely close to comp.eting H with for the 1st time. We're a casual group with a stable core of loyal team mates looking for people who like to play on a somewhat daily basis. Currently we do well on Tier IV of the Sith Raid, we smash the Heroic Pit Raid and normal Tank Takedown. Raids start generally at 6pm EST. Marauders of Malachor 2 is a newly formed expansion guild of the marauders family of guilds, we are seeking new/mid level to advanced players looking to leave their current guild or even the In-Game starter guild system and want to start taking their game play to the next level. 1. Bring several smaller but strong guild into one cohesive Guild to empower its members threw growth and understanding of the game. We are a 3+ year old and independent guild, looking for active players. Due to being together for such a long time we developed a good routine for most of the game modes. 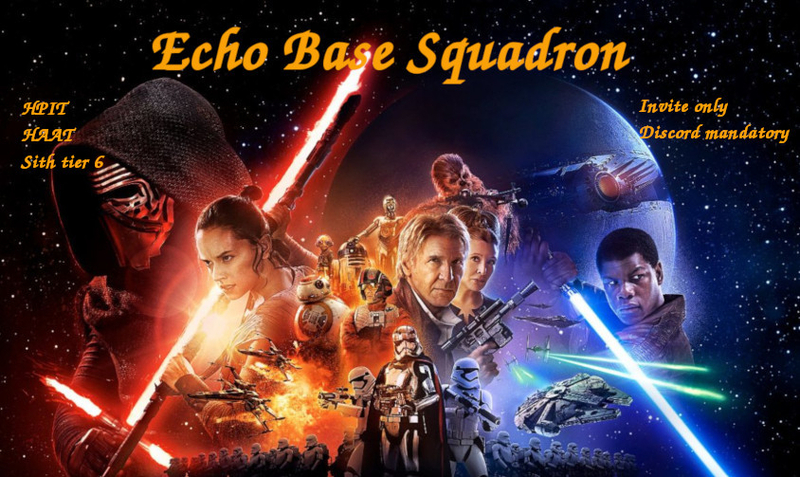 We are a chill, yet fairly competitive guild with a core of experienced players. We are seeking to replace some players that quit the game. Friendly, mainly FTP guild looking for active players over 2.5mil gp who either have or are working towards JTR. Beyond Omega is a European guild that has recently started killing HSTR. 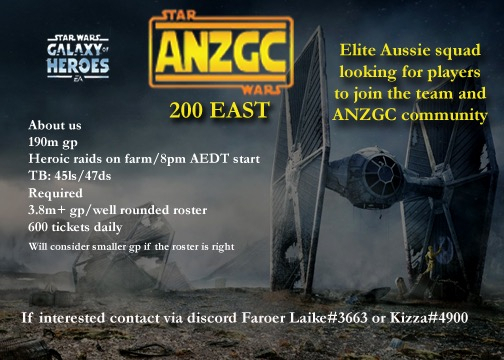 We are looking for 2-5 players with good rosters to help us make the kills smoother. - Prefer if you have at least one good HSTR team, more is better obviously. Members from Central Europe to the middle Pacific. No crazy/$$$$ expectations. Just be active. TW is not our strong spot. But you'll always get 2 zeta. Your SWGoH experience should be fun, were you are able to have a life outside of the game. Our leaders/peers understand that life gets busy sometimes. Take comfort knowing you won’t be booted out at a moment's notice. Sure we have expectations and goals, and non-participating members are booted after warnings, but there is room to play your way. Leadership drives a good balance between motivating progress towards guild objectives and just letting members have fun. You don’t have time for a guild that is going to dictate how you play. Booze Blasters and Bounty is searching for active players to join our ranks. We are currently an 87 million GP team with 11 slots to fill. 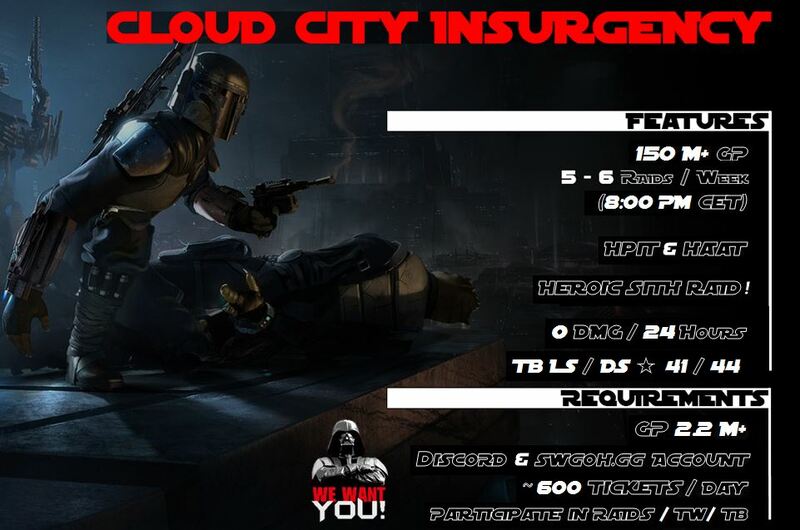 We are fairly laid back but do ask for 400 raid tickets daily and participation in all events. We run Hpit, and Haat at least twice a week. 29 stars on both light and dark side TB. If you are interested in joining us message me at Biggs Fartlighter#7190 of discord or 267-713-465 in game. The Corellian Refugees, an independent guild, has room for 1 new member! We're a relaxed yet dedicated group, free of drama. You'll find that we're more about community than we are compliance - rules are simple, and we succeed as a team. GP is 146M (at 49/50). 41 stars in both DS+LS TBs, with increases each time. Players who join tend to stick around - average lifetime raid tix = 250K+. 4SS4SS1NS is a friendly, supportive guild recruiting new members! hi I'm R2E2, Ally code: 468-238-674, i'm a scoundrel droid that enjoys long flights in space and steaming hot oil baths. I want a droid babe with outstanding features that won't grind my gears. wait.... wrong section. Tank and Rancor go pretty quick. We aren't too worried about your GP as long as you are playing the game fairly intelligently and producing raid tickets. Usually have 50 members, had a few key players join an r.l. friend's guild and recently booted a few too many slackers and we'd like to complete our rework with you. we are an active but chill guild. Requirement: be a daily players and earn your keep. "I see your sch'wartz is as big as mine, now let's see how you handle hit"
We have long been farming HAAT & HPit. (6 PM PST) We do Tier 6 STR and hope to do heroic next. 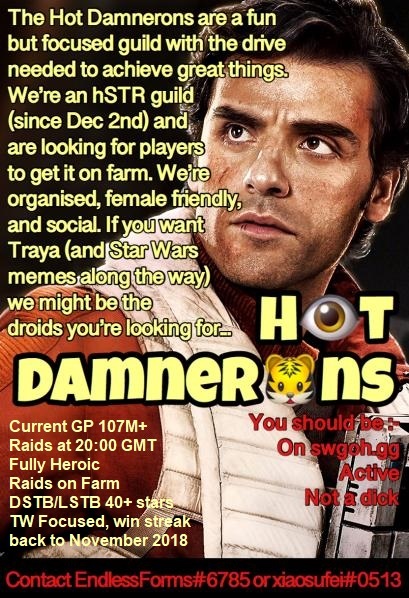 We are a casual guild but do require the above. Looking for players of 2 million + GP. 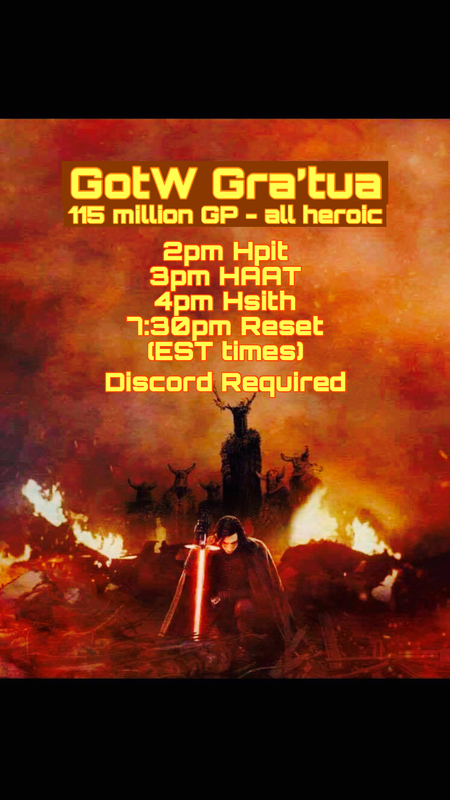 Currently we have 49 players and 102mil GP, but due to kickrules we are looking for two players. 2.3 mil average gp. 43 members with 101 mil gp. Gaming Geeks is a looking for 10-15 active members to join us, or merge with our clan. We have 34 active members and want to expand so we can reliably win more TW. We regularly do Heroic Pit, and 5th tier Sith and Tank. Looking for active, casual players to have fun. We are not like the other aggressive clans. We just ask that you join us in the fun! Add me if you have any questions! Knights of Alderan are in need of new members, nice, friendly & active, but not a HC guild. We will accept any lvl 80+ who will contribute to the guild.